Girls and boys toys: Is the toy industry demonised for just supplying demand? Are there girls and boys toys? 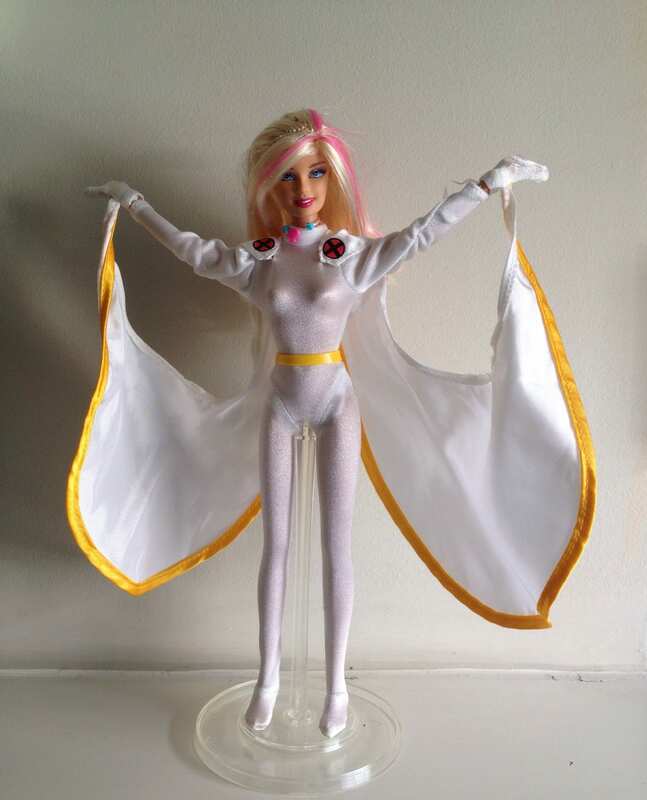 Our X-Men Barbie – if she was an actual toy (as opposed to Beach Barbie wearing a Storm circa ’96 outfit), would she be categorised as a boy’s or girl’s one? If the toy industry were at all sympathetic to our issues with the false idea that there are girls and boys toys, we wouldn’t have to keep complaining. But is it fair to criticise them? Recently, kids brand consultant – and father of 2 girls – Steve Reece (@nevetseceer) wrote this piece on it. Let’s just say it lost me at labelling those like myself, who disagree with the concept of girls and boys toys, as ‘bandwagon jumping opportunists’ – and it went downhill from there. I shared it on Twitter, tagging Steve, and he & others responded. Rarely does anything useful or constructive result from people with entrenched opposing opinions debating online. This was no exception. As the twitter back & forth ensued, there were many of his points I failed to adequately address or respond to. Other people, notably scholar Elizabeth Sweet, had a more meaningful contribution. Here’s my tweet, followed by a sub-edited version of the ensuing conversation about girls and boys toys. Carrie Proctor: Does Steve Reece not see that children pick certain toys because they’re taught to do so by society? Enter Dr. Elizabeth Sweet, a Postdoctoral Scholar whose current research focuses on gender and children’s toys. So far more qualified than me/most in this area. Dr. Elizabeth Sweet: My research finds that toys are far more gender segregated and stereotyped now than ever before. Simply not true that toys have always been so gender defined nor that they have to be. My initial tweet also provoked this response from freelance writer Lisa Granshaw. I then noticed that Steve had tweeted a response to those criticising his article, and the conversation shifted over to that thread. Elizabeth Sweet initially responded (before I butted in). Elizabeth Sweet: Actually, not a reflection of current reality if you look at demographic & attitudinal measures in re: to gender. I would revise this piece I wrote in 2012 to say that gendering today is far more extreme than in ’50s. Steve Reece: Really…? Difference between what people say hypothetically versus Behaviour measured by what sells…? Elizabeth Sweet: When you only offer people one choice (e.g. highly gendered toys), is it surprising that they choose it? Me: (To Steve) Chicken/Egg. They buy what you sell. I’d buy more female Star Wars & superhero toys if sold. Steve Reece: You may buy, but are there enough like minded to justify tooling etc? Toy companies supply to demand. Me: How do you know girls won’t buy/play Star Wars/Marvel, when they’re labeled as ‘boys’ brands? Elizabeth Sweet: Toy companies are actively shaping demand by offering few and narrow choices vs. responding to it. Steve Reece: Commercial reality = if paying major license fees toy companies want every product that will sell. Me: In the meantime, risk averse toy companies are excluding girls. Where’s the child development in that? Steve Reece: Hard to stay in biz if don’t sell products made…no child development then? Me: ICYMI – “Opportunist commentators have jumped on this bandwagon to blow their own trumpets, and… advance their own ends.” Nice Steve Reece. Steve Reece: Demonising toy industry which positively contributes to development of billions of kids globally, for supplying demand. Also nice. Me: What’s positive for girls who think science sets, doctors kits, or toolboxes are for boys – because they’re not pink? Not just toy industry – clothes, books, magazines, it’s a problem with most things being sold to kids. Elizabeth Sweet: Clearly there is a demand for something different…this sold out immediately. Me: (to Steve) I will never buy into your argument that sexism is justified to sell toys. Is racism too? The removal of Gamora from so much Guardians of the Galaxy merchandise is appalling. But you think that’s ok? And there the conversation ended, and I’m glad it did as there was nowhere new I was able to take it. If this is the attitude of the toy industry to our concerns with the notion of girls and boys toys then we have a long way to go, no matter what lip service they pay to our issues with their gender categorisation, and screening of licensed characters by gender – such as the aforementioned cases of Princess Leia, Black Widow, and Gamora being absent from a large chunk of movie tie-ins. The citing of market research and of responding to consumer demand – without acknowledging the industry’s role in skewing those results through their marketing, or creating that demand – is frustrating. These companies choose to create products for children, which as far as I’m concerned means they have a responsibility to not only make a profit, but – at the very least – to not negatively impact our children’s lives. It’s not much to ask, and the two things are not mutually exclusive. And frankly, the idea that the likes of Hasbro, Mattel, or Disney might go out of business if they and retailers sorted and labelled toys by type or function instead of gender, is laughable. But these industry behemoths do need to evolve their offering, for their own sake. Take Barbie, the queen of the pink aisle. Her global sales have significantly dropped in four of the last five quarters, and for an even longer period in the US (about 2 years). Some of Mattel’s initiatives, like the Barbie Project are interesting. Others, like putting her on the cover of a Sports Illustrated Swimsuit Edition, are troubling. However, if the choice really is as Steve Reece claims, between these companies survival or our children’s positive development, then I’ll happily wave bye bye to Optimus, Mickey, and Barbie. The toy industry’s ability to generate profit does not supersede our children’s rights to grow up without having profit-motivated limits placed on their imaginations, aspirations, and ambitions. But there is no reason the removal of these limits and the industry’s profits cannot happily co-exist. If anything, it will become necessary for both parties to flourish. Oh, for another perspective on the issue of girls and boys toys, please read this excellent post from someone who is at the frontline of all this – working at a toy shop! His point is a very perceptive one that has lead me to question how I would shop as a parent in this situation. Thanks for sending people over my way 🙂 hope my post brings something to the discussion. I’ve got two issues I wanted to bring up regarding your post. The first one is simple, we (humans) tend to spend a lot of time talking to people who agree with us. I don’t see much useful communication between either side in this debate, which is sad. Those who work in the toy industry think differently about what toys are. For many of us, on top of the unquestionable developmental contribution toys make there is also an element of luxury, to buying into a sub-culture, especially when it comes to toys linked to famous books/movies. The problem with these licenses is they cost a lot of money and there’s a lot of competition over them, with this on mind toy companies play it very safe or risk a lot of people’s livelihoods. I agree with the idea of opening things up but they won’t do it if they can’t be sure of buyers in their thousands/millions. I’m not defending the sexism but I am defending the careful attitude to what they see as a high risk with potentially devastatingly low financial reward. Toy makers are crumpling left right and center at the moment, there’s a lot of fear. Going on the attack against people in fear of losing their jobs will not be met with the most rational/sympathetic reactions. These people aren’t purposefully trying to make girls/boys feel excluded, a lot of the time they just see themselves as playing it safe. I might not agree with the hard-line adherance to sexist attitudes but I can understand why they do it and I think it’s got a lot more to do with perceived risk than it has to do with these people actually being sexist themselves. Thanks for the comment John. In terms of my own tone in this or other posts, I guess it stems from the fact I am essentially a frustrated parent/customer. As much as I despise Disney Princesses, I do my best to ignore them and offer alternatives I believe in. But when the same company chooses not to create product from properties they have not even created but acquired (Leia & Star Wars; Black Widow/Gamora & Marvel), the growing frustration needs an outlet. Perhaps I should be less forthright, but then I’m not a lobbyist or a career campaigner – I’m just a parent/consumer with a small platform for venting, and a valid if blunt & self interested point. As anyone who know me will tell you – I LOVE Marvel and Star Wars. They were my childhood. But I’ll abandon them as toy & clothing brands if Disney don’t stop with this boys only trench they are embedding them in. Which is no good for anyone.